In West Norwood we had to install double glazing to original sash windows and then sound proof them, and if you are in Forest Hill then this job isn’t all that far away for site inspection. The other major job was to make good a set of French doors that were in a bad way. Let’s start with double glazing of the original sash windows and then move into the French doors after. The first point to note about these sash windows, the double glazed units could fit into them nicely because the sash depth was 40mm. This is a very comfortable size to install a 4-6-4 or 4-8-4 double glazed unit. Aided by the fact these windows were in excellent structural condition, this was one of the easier installs we would expect. There’s three important parts to double glazing existing sash windows and they all need to be carried out well to ensure the end result is high quality. 1. 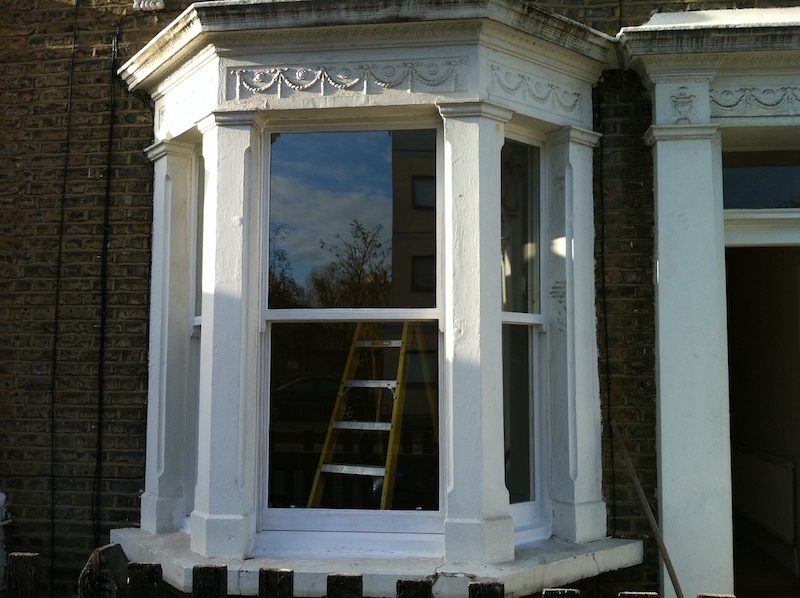 Ensure the sash windows are structurally sound and can handle a double glazed unit without compromising the strength. 2. Measure well for the double glazed units allowing a 2-3mm tolerance for the glazing to sit. We must install a high quality sealant all around the perimeters of the sash to make sure the double glazed unit is well protected and doesn’t mist up quickly. 3. The sash must be decorated well to seal in the exposed timber glazing bead and new double glazed unit. 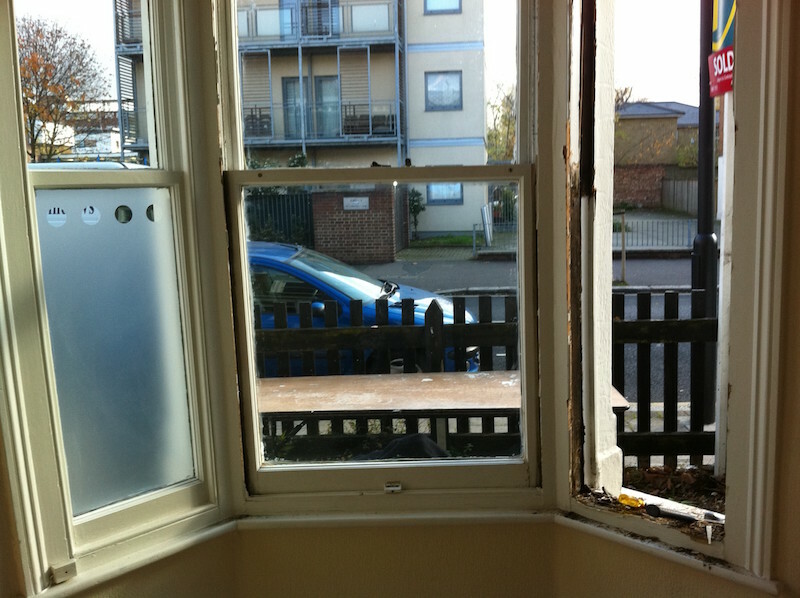 There’s often argument that double glazing original sash windows is not effective and not the right thing to do. I have never really understood this argument. The price to the homeowner of double glazing the existing sash window is normally 30% cheaper than manufacturing new double glazed sash windows and installing into the original frame. The result is the same in most cases because if you have uprated glazing in the new sashes, beyond a standard Pilkington Low-e unit, that you would get from double glazing originals, then the costs will rise accordingly. There is one argument I always find quite logical with regards to double glazing the original sash windows. On site double glazing is considerably more difficult and time consuming than manufacturing new sashes in a comfortable, heated workshop! First step is to remove the sashes and clean up frames. The sashes are then taken into the mobile workshop. All work is carried out on site and insures your property is secure at all times. Once the rebate is cut the double glazed unit we measured and made prior to arriving on site will be offered in. This unit will be bedded in with Butyl Putty or a similar compound which will help keep the double glazed unit in good condition for many years to come. The glazing bead then attached and also bedded in with a sealant to stop water penetrating behind the unit. At this stage the sash windows are now double glazed and ready to be fitted back with a draught proofing system rebated and installed. There is however the possibility you have instructed us to decorate as well. If this is the case then we will begin preparation for decoration. If not, then the windows are now ready to hang back into situ with draught proofing systems attached that will aid in the sound proofing process. If you’d like to learn more about draught proofing systems for sash windows then please follow the link provided. Here is an example of a window that has been double glazed using the original sash windows. As you can see the result is almost undetectable. The only clear giveaway close up, is the gleam of the new glass. The client didn’t wish to have the windows decorated – quite understandable as he was more than capable of carrying out the painting himself. This represents a serious amount of money saved. 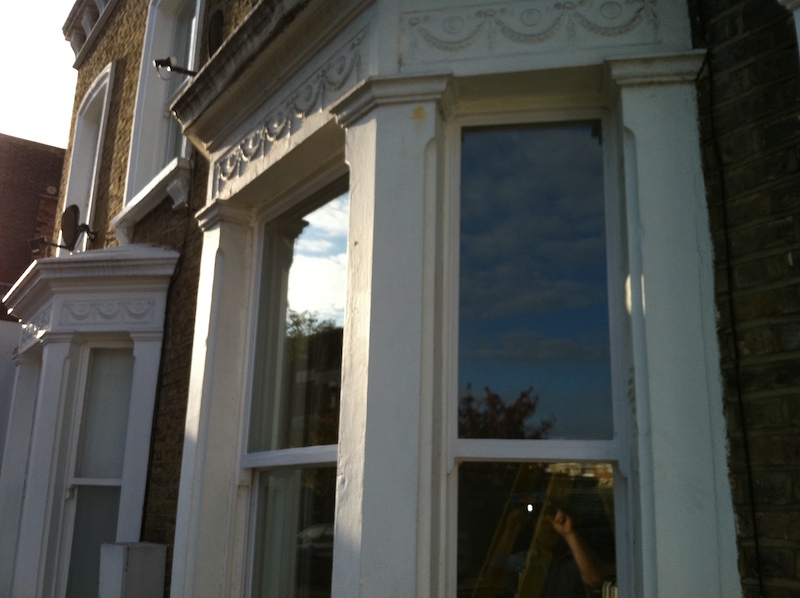 As you can see from the images we also replaced the wooden sash window sills as well. 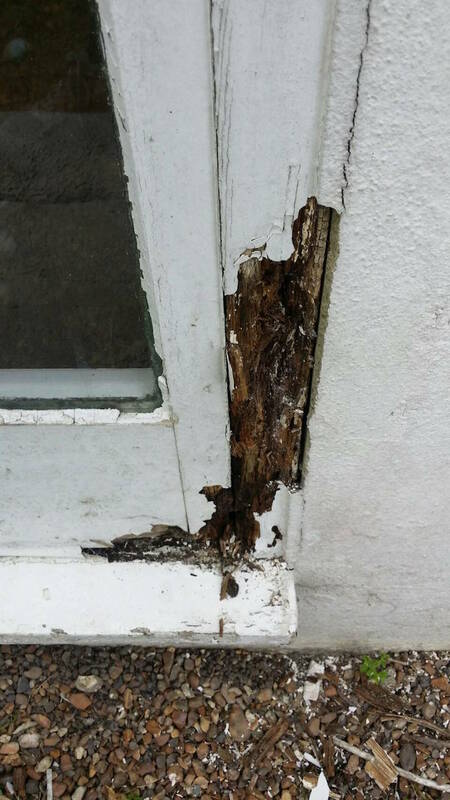 More about sash window repair and splicing of sills can be found in the resource highlighted. There’s also considerably more information on double glazing original sash windows at the link provided. In this case study the French Doors were in bad shape indeed. You can see from the pictures the rot had run almost all the way though to the inside. We needed to remove all the road and splice back together. Normally the task of rebuilding French doors is far more complicated, as you can see in the link attached. On this occasion the French doors that need repairs are fixed, and that makes the job a great deal easier. 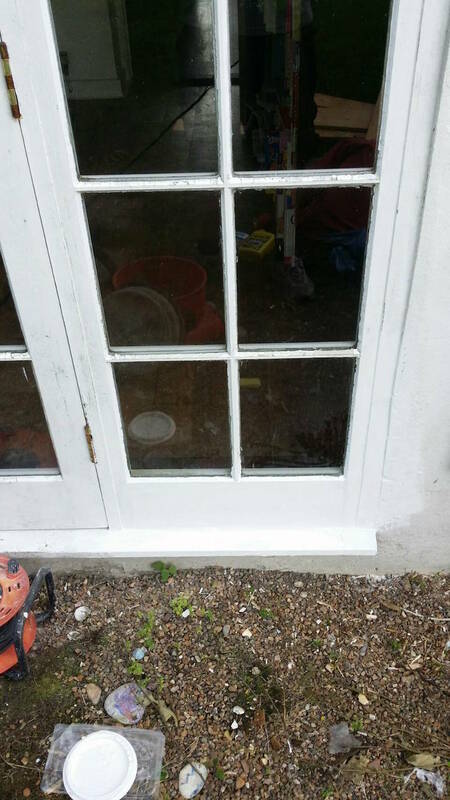 To make an effective repair on this French door required complete removal of the lower rail. A French door is structurally almost the same as a sash window, just thicker, and built with more strength. The mortice and tenon method is still heavily relied on for structural strength. We spliced out the lower rail and stile back to good timber. The repair was then treated with Curprinol Five Star. This is a treatment to remove any unwanted Wood Decaying Bacteria. Once this was all dried timber is cut to length and then fitted back together correctly with resin joints to provide structural strength. The resin is then sanded and repairs are made ready for priming. With the repairs primed there’s little telling that the French door has ever suffered any rot at all. All that remains here is to decorate and as long as maintenance is upheld then the repairs will last for many years to come. If you’d like to see more complicated French door repairs, and the lengths we will go to save existing joinery then please follow the highlighted resource provided. If you have any sash window repairs, double glazing, or French door repairs you would like to work on in West Norwood or Forest Hill then we would be glad to receive your phone call or email today!